The High have announced plans to reform to play their first gig in 22 years, headlining the second stage at the Gigantic Indie All-Dayer at Manchester Academy on May 23rd. Their excellent debut album Somewhere Soon, released in 1991, got caught up in the Madchester backlash and its follow-up Hype never got granted a proper release by their label. So now it's time for them to set the record straight. 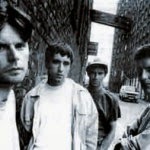 Formed in 1989, The High were John Matthews on vocals, who'd previously been the singer of Turning Blue, Andy Couzens, who'd had a stint as guitarist with The Stone Roses in one of their early incarnations, Simon Davies on bass and Chris Goodwin on drums, who had previously spent time as drummer in the early days of Inspiral Carpets. Signed to London Records, they released a trilogy of great singles - Box Set Go, Up And Down and Take Your Time - before a re-recording of Box Set Go with legendary producer Martin Hannett saw them crack the Top 30. 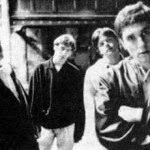 The label's support wavered though and their debut album Somewhere Soon limped to number 59 in the charts despite being full to the brim with dreamy guitar tunes whilst much lesser bands set the charts on fire. Despite being based in Manchester, they refused to tailor their sound to fit in with the love of almost everything that came from the city at that point. They did have a minor hit with an interim single More, before they went into the studio to record what was supposed to be their second album Hype. Despite releasing two singles from these sessions - Better Left Untold and Sweet Liberty - the label left the record on the shelf and the band came to an end in 1993. Now they're back and we spoke to guitarist Andy Couzens about the reasons for the reformation and what we can expect. First of all, it's been 22 years since The High last played together, why is now the right time to play again? It is the first time we've been asked and with the 25th anniversary of the release of Somewhere Soon a chance not to be missed. Yourselves and several other bands around that time got a bit of a raw deal from the music press when the Madchester backlash kicked in. Does it feel like you have a point to prove that you were a great band that got a raw deal at the time? I never really paid any attention to the press and 25 years later this gig is about enjoying performing those songs not proving anything. Will the line-up of the band be the one that recorded Somewhere Soon? No, Just John Mathews and Andy Couzens from the original line up will be performing with additional musicians. The second album, Hype, was recorded but never given a proper release by London. Are there any plans to make this available at some point? I can't see us releasing Hype we were never happy with it. It's four months to the gig, but have you been back in the studio rehearsing yet and have you worked out what you're going to play? No,we haven't rehearsed yet but the set list will comprise of songs from Somewhere Soon and singles. Is this likely to be a one-off or are you planning other gigs around the festival and afterwards? At the moment it is a one off but never say never. The High's website can be found here. They are also on Twitter. Header photos taken from their official site. Gigantic takes place over three stages at Manchester Academy on Saturday 23 May. It is headlined by Echo And The Bunnymen and also features Inspiral Carpets, Pop Will Eat Itself, Eat, Diesel Park West, Echobelly, Mark Morriss, The Woodentops, Gang Of Four, Bob and Hurricane No 1. Tickets are available from this link.